Everyone else hear a trillion good things about Guardians of the Galaxy? Good. Because the rumors are true, friends. This is a gem of a film. 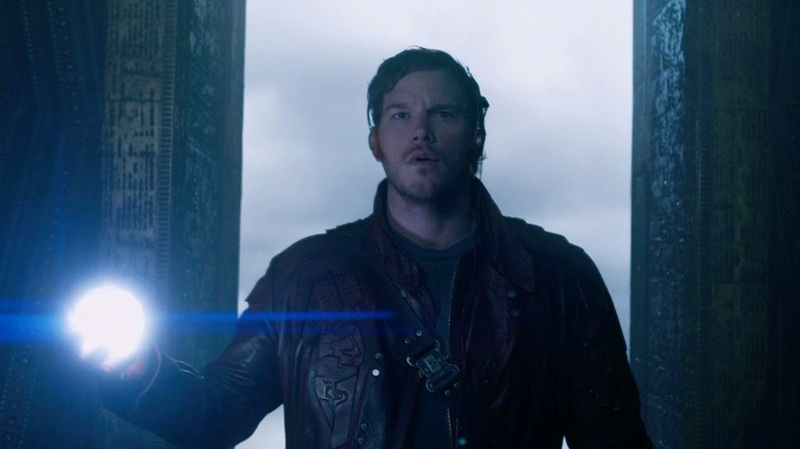 The plot revolves around Peter Quill, a man with a history as an outlaw and thief, who makes a living selling the things he steals. After having stolen a mysterious orb from a deserted planet, however, Quill finds himself a bit more wanted than usual. After being attacked from all sides by different (alien) people, he learns that this orb is perhaps a little more precious than he had originally supposed. We come to find out that the orb holds a precious, and extremely powerful stone, that can give the owner of it power enough to destroy the entire galaxy. Working against these miscreants, however, is a radical overlord named Ronan. Pissed off at a peace treaty that has criminalized fighting between his race and their ancient foes, Ronan has it in his head to pick up the orb and use it as he pleases. 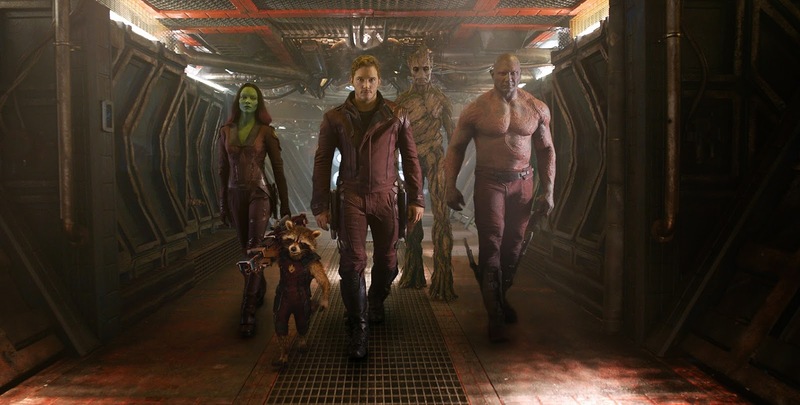 Determined to keep the universe intact, and being the only ones who know of his plan, Quill bands together with Ronan's ex-lackey Gamora, two bounty hunters named Groot and Rocket, and an ex-con named Drax, to form...(wait for it)....The Guardians of the Galaxy. Additionally, whereas most of Marvel's fodder is pretty action-packed and adrenaline-pumped, Guardians gives us a chance to laugh at our main characters. Even though they're all pretty deadly by themselves (I mean, at one point they ALL are in jail), the misperceptions between their cultures create a hilarious backdrop to a typical save-the-world story structure. For example, Drax (played by Dave Bautista and my personal favorite character besides the obviously adorable Chris Pratt) comes from a planet where metaphors don't exist, creating extreme confusion between he and essentially every other character every five minutes. "Nothing goes over my head...my reflexes are too quick." All in all, an extremely refreshing film from the overcrowded superhero genre. Nice to see a blockbuster worthy of the name. 9 outa 10. Very fun. Great review! I had a lot of fun with this film. 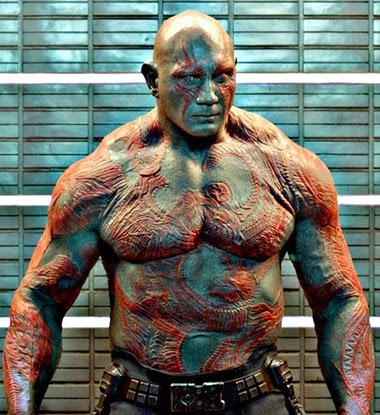 I loved how Drax didn't understand metaphors and how all of Earth's idioms went completely over the other character's heads. That was a nice touch. Oh my god, the English nerd in me absolutely loved that. "Let us put more of this liquid into our bodies!" and "Nothing goes over my head, my reflexes are too quick...I would catch it..." Probably the first time in known history that stiff acting from a former celebrity has worked out so incredibly perfectly. "Grown-up kid's movie" is a pretty great way to describe this. One of my favorites films of the year so far. So much fun. I'm ready to go back for another dose.